This time of year you might notice some flies repeatedly shaking their legs. A closer look will show a tiny, pale brown thing attached to the leg. This is actually one of our native pseudoscorpion Thalassochernes tairiensis. What is is doing is hitching a ride on the fly. This is a habit known as phoresy. It’s a way for the animal to get a ride somewhere else. For minute animals unable to cover a lot of ground, phoresy is quite handy. 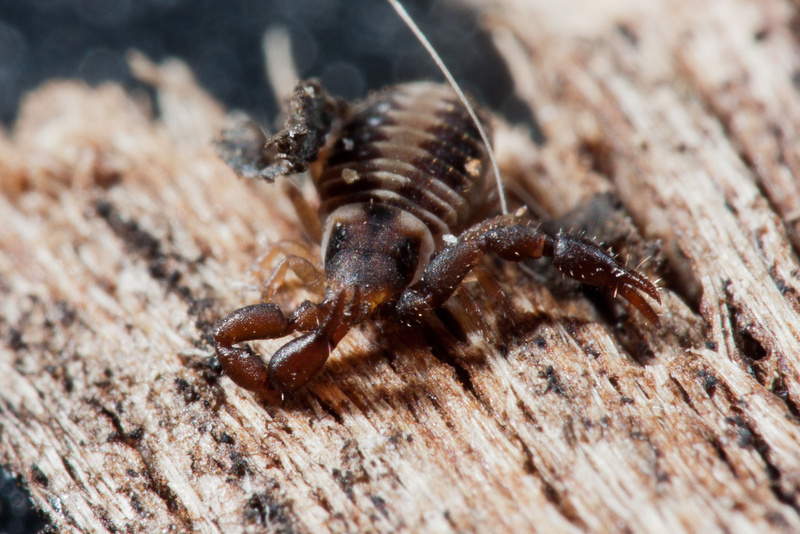 Pseudoscorpions are an order of arachnids that are widely distributed. As an order, they are on par with spiders or scorpions or harvestmen. 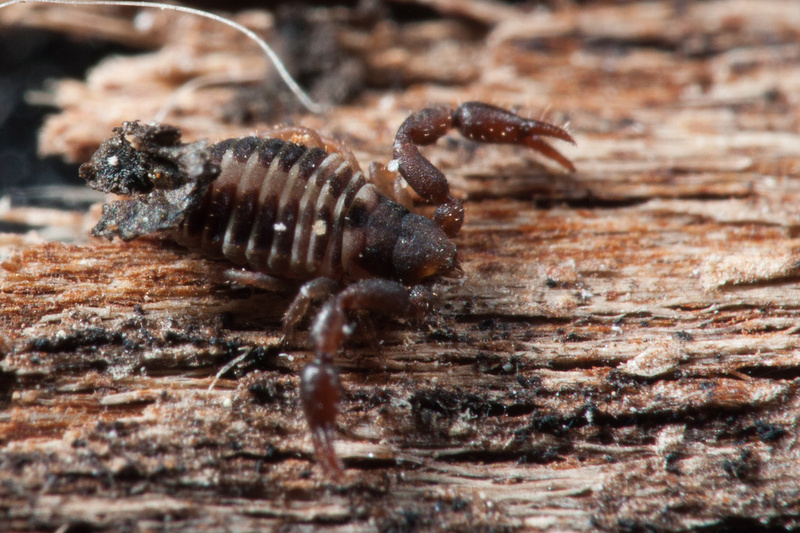 Despite being even more widely distributed than scorpions, most people are not aware of them. The reason is simple. These arachnids are tiny and cryptic. They dislike the light and move away from it. They’re usually very small. Most are much less than 2mm long. They have a number of appealing traits however. The female feeds nymphs a nourishing liquid. They also have small silk glands, which in some families are used to make little domes to protect the female and her nymphs. 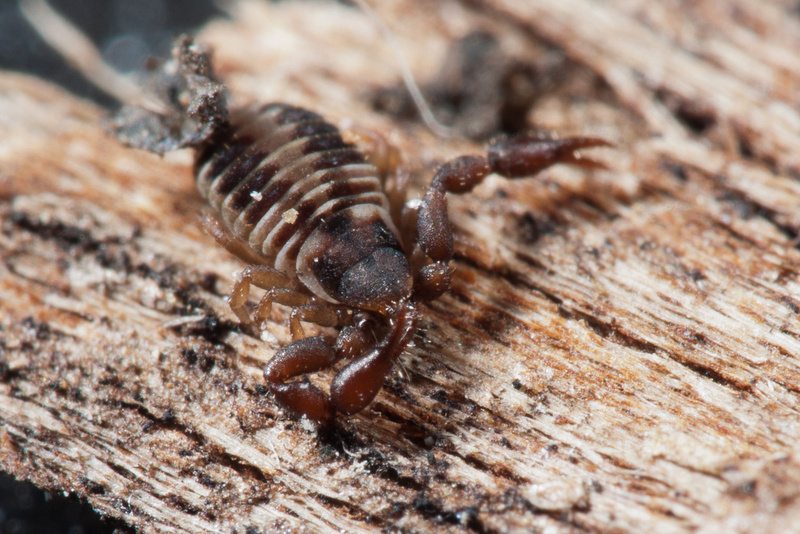 Despite their pincers and segmented body, they’re not a descendant of scorpions. Their poison apparatus is on a tiny tooth, on one of the fingers of their claw. It’s pretty lethal if you’re a mm long and have 6 legs. 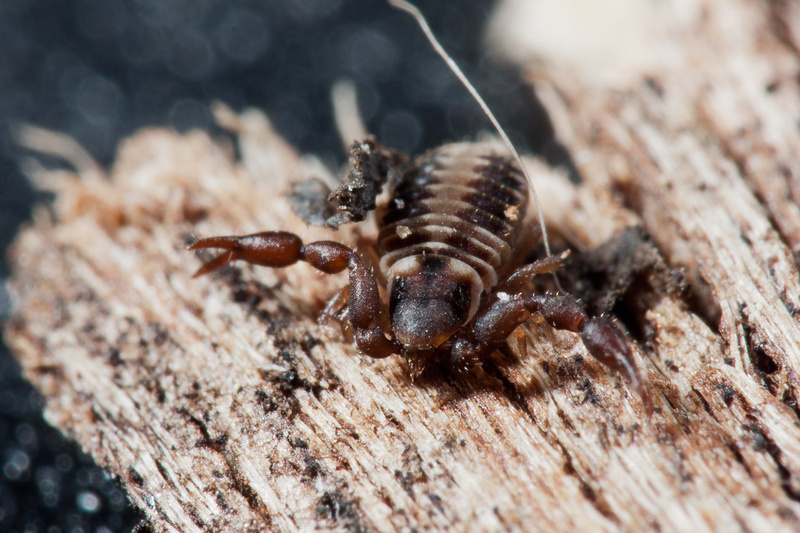 To get these pics I waited for the pseudoscorpion to detach herself. To boost the magnification (the arachnid here is about 2mm long) I attached a 24x Raynox microscope adapter. Then my macro flash (the two small heads of this are much easier to work up close than a ringflash) was attached to boost the shutter speed. I had hoped I could get some shots hand-holding the camera but this was impossible. The depth-of-field was critically narrow and for a moving subject, impossible. So it was then on to the tripod (and thankfully, the geared head). Even with the 24x magnifier I still couldn’t see the edge of the carapace so a bit of guesswork was involved. At least with the arachnid being blind, I didn’t have to worry about getting the eyes in focus. They have a number of long, sensitive seta (trichobothria) on their claws that are used to locate prey. Bear in mind with these pics, almost all the detail shown here is invisible to the naked eye.